New York City Department of Environmental Protection (DEP) Acting Commissioner Vincent Sapienza today announced the launch of Don’t Trash Our Waters, a public awareness campaign aimed at reducing litter and improving the health of New York City’s waterbodies. Trash discarded on city streets and sidewalks can wash down catch basins and end up in our surrounding waterbodies—threatening marine wildlife, putting human health at risk, negatively impacting recreational activities such as swimming, fishing and boating, and costing New York City taxpayers millions of dollars to clean up. To combat this issue, and in partnership with the New York Aquarium, The New York City Department of Sanitation, and NYC Parks, informational posters imploring New Yorkers to properly dispose of their garbage will be displayed this summer at various locations in Brooklyn’s iconic Coney Island, which will serve as a pilot site for the program. Bright, eye-catching illustrations—featuring a dolphin, a seal, a turtle, a whale and an oyster—have been placed at the New York Aquarium, along the boardwalk, at comfort stations, on bus shelters, in subway stations, and on Sanitation trucks and street sweepers around the city. These posters carry a simple message, reminding New Yorkers to do their part and properly dispose of their garbage. To help spread the message, DEP will be giving away free tickets to the first 1,000 people to visit the New York Aquarium on Saturday, June 24. 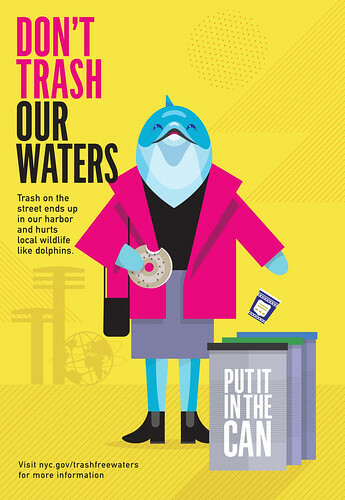 Trash that ends up in the water can have a wide range of negative impacts—from the injury or death of marine wildlife that accidentally ingest garbage or become entangled in litter, to humans being exposed to pathogens and toxins when trash floats by where they boat, swim or fish. DEP inspects and cleans approximately 148,000 catch basins throughout the city and utilizes a fleet of skimmer boats, along with booms surrounding 23 major sewer outfalls which are used to capture debris including wood, plastic, metal, rubber, and glass. DSNY removes 1.7 million pounds of debris from New York City's 6,000 miles of roadway each week and maintains 25,000 litter baskets. Each summer day, NYC Parks picks up approximately 120 tons of garbage left behind at beaches, ballfields, picnic areas and other green spaces. Marine wildlife, including New York’s native turtles, fish and sea birds, can become entangled in trash debris or mistake it for food, slowly killing them over time. Even with the City’s dedication to combating litter, everyone must do their part to make our city a clean and healthy place to live for all New Yorkers—including the marine wildlife that resides in the harbor and surrounding waterways. Always make sure to use litter baskets, and use them the right way. Garbage scatters easily when pedestrians throw trash on the sidewalk, drivers toss litter onto the street, or residents improperly discard of household waste. The issue is far-reaching and a small, careless action can have a big, negative impact. New York City is launching this campaign in connection with its MS4 Program which aims to manage urban sources of stormwater runoff to protect and improve water quality. When it rains, stormwater that flows over streets and other impervious surfaces, can sweep up pollutants such as oils, chemicals, pathogens and sediments. For areas of the City served by the MS4 (municipal separate storm sewer system), the pollution carried by stormwater runoff is discharged directly into the City’s waterways, which can have a negative impact on water quality and recreational uses. To address this, the City is currently developing a comprehensive plan to prevent multiple types of pollution from entering our waterways. For more information about this campaign, please visit nyc.gov/trashfreewaters. For more information on how you can reduce your footprint further, visit nyc.gov/zerowaste and take the pledge. DEP manages New York City’s water supply, providing more than one billion gallons of water each day to more than nine million residents, including eight million in New York City. The water is delivered from a watershed that extends more than 125 miles from the city, comprising 19 reservoirs and three controlled lakes. Approximately 7,000 miles of water mains, tunnels and aqueducts bring water to homes and businesses throughout the five boroughs, and 7,500 miles of sewer lines and 96 pump stations take wastewater to 14 in-city treatment plants. DEP has nearly 6,000 employees, including almost 1,000 in the upstate watershed. In addition, DEP has a robust capital program, with a planned $20.7 billion in investments over the next 10 years that will create up to 3,000 construction-related jobs per year. For more information, visit nyc.gov/dep, like us on Facebook, or follow us on Twitter.